Grand Theft Auto: Vice City Stories was released as an exclusive game for the PlayStation Portable on October 17th 2006 in North America, November 3rd in Europe, and November 10th in Australia. Because of its success, it was later released on the PlayStation 2 console on March 6th, 2007 in North America and on March 9th in Europe. It is the second Grand Theft Auto game to appear on the handheld console. The game was developed by Rockstar Leeds, and was published and released by Rockstar Games. The PS2 version has exclusive content that the PSP version doesn't have, such as additional unique stunt jumps and rampages. 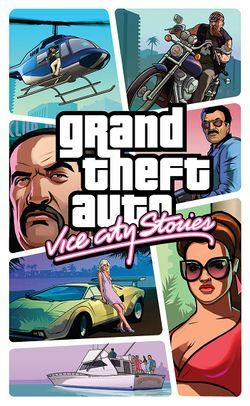 Vice City Stories marks the series' return to Vice City, with the game taking place in 1984, roughly two years before the events of Grand Theft Auto: Vice City. The game focuses around Victor Vance, the brother of Lance Vance who betrays Tommy Vercetti in GTA Vice City. Victor briefly appears in GTA Vice City in the opening cutscene, in which he is killed during a drug deal gone wrong. In GTA Vice City Stories, the Vance brothers find themselves falling on hard times. Victor is a 28 year old U.S Army soldier who has been kicked out of the service, while Lance is a drug-addicted wreck. They decide to take action and try to make a name for themselves. The game follows the siblings' attempts to take over Vice City. This page was last modified on 20 April 2012, at 20:08.